MOSCOW WAS THE SECOND HOME TOWN OF ANNA GOLUBKINA: SHE WAS BORN IN ZARAISK ON JANUARY 28 1864. GOLUBKINA BECAME A MUSCOVITE IN 1889, WHEN SHE ENROLLED AT THE FINE ARTS WORKSHOP OF THE ARCHITECT ANATOLY GUNST. 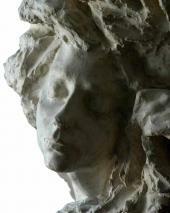 LATER, IN 1891-1894, SHE STUDIED AT THE MOSCOW SCHOOL OF PAINTING, SCULPTURE AND ARCHITECTURE. GOLUBKINA LIVED IN MOSCOW FOR A LONG TIME: ALTHOUGH SHE RETURNED TO ZARAISK MANY TIMES, AND MOVED TO ST. PETERSBURG TO STUDY, AND LIVED IN EUROPE FOR LONG PERIODS FOR THE SAME PURPOSE, SHE ALWAYS WANTED TO MAKE HER HOME IN MOSCOW - TO HAVE A STUDIO IN THE CITY, AND TO PARTICIPATE IN ITS CULTURAL AND INTELLECTUAL ACTIVITIES. Golubkina had different studios at different times. The most famous one was located on Bolshoi Levshinsky Pereulok, in a building where, in 1932, the authorities opened the Golubkina Museum, now a part of the Tretyakov Gallery. Her other studio, which has not survived, was located on Krestovozdvizhensky Pereulok - it was there Golubkina created her most important works early in the 20th century. In 1902 Valentin Serov and Sergei Diaghilev visited her there: Serov wanted to show his companion a mantlepiece, titled "Fire", which astonished him. 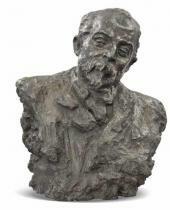 The visit was mentioned in Olga Knipper's letter to Anton Chekhov; she also wrote about the bas-relief for the Moscow Arts Theatre, the piece Golubkina was finishing in 1902. In her studio on Krestovozdvizhensky Pereulok the artist accomplished a large number of sculptural portraits, some commissioned, others featuring models of her choice. 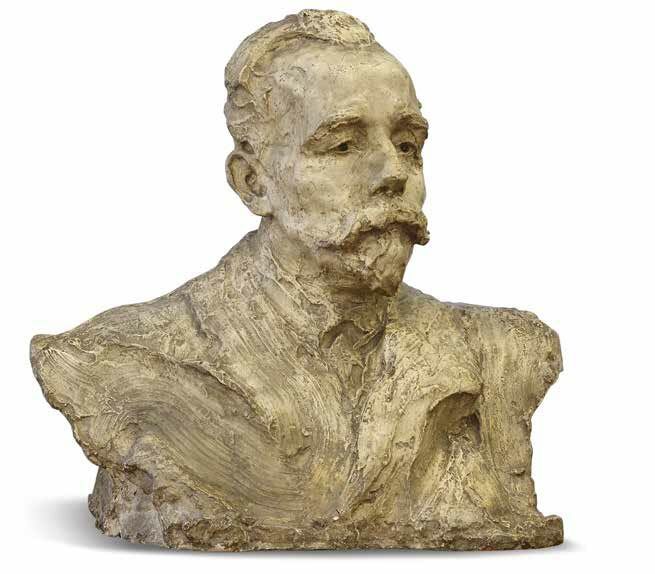 Working there, Golubkina also accomplished several major pieces: the mantelpiece "Fire" (19001, tinted plaster)*, "A Man Walking" (1904, bronze), the relief "The Wave" (1903, tinted plaster), and the sculpture "The Earth" (1904, tinted plaster). Golubkina also created objects of applied art and elements of architectural decor, including a design of the monument to Russia's first printer Ivan Fedorov (1902), which was to be erected in Moscow. At the beginning of the 20th century the Russian public began to see Golubkina's works properly: living in Moscow, she was able to participate in the shows of the most famous artistic groups. Displaying her works regularly over many years, without interruptions, the sculptor was eager to keep in touch constantly with her public, and to provoke interest in her sculptural messages. 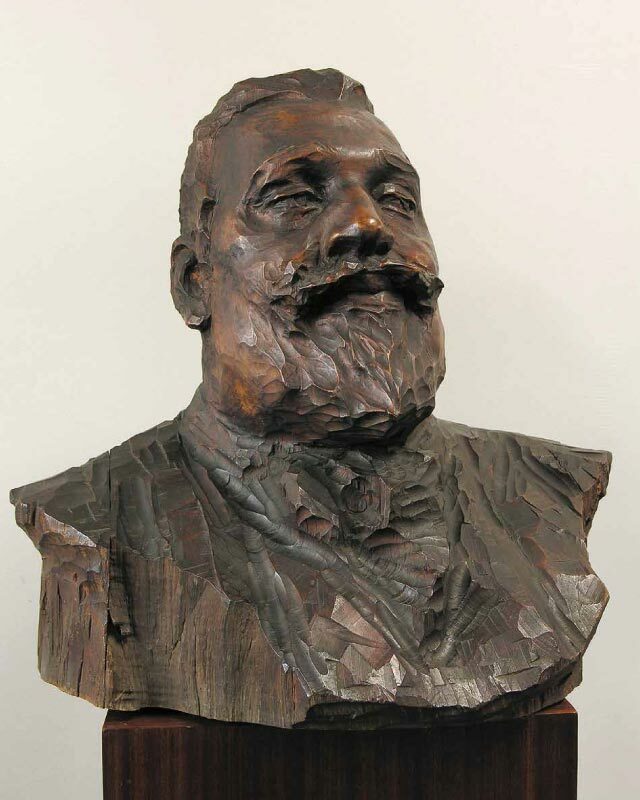 In 1899, returning to Moscow after her second visit to Europe, Golubkina displayed at the 19th exhibition of the Moscow Society of Art Lovers (MSAL) her statue "Old Age" (1899, tinted plaster,) and her portrait of the French zoologist Edouard-Gerard Balbiani (1898, tinted plaster). Awarded a medal from the Provence Academy of Arts and Literature at the 1899 Salon and favourably reviewed in the French press, these pieces were a testimony to Golubkina's artistic maturity. She continued to exhibit at the MSAL's shows until the start of World War I.
Golubkina participated in the exhibitions of the Moscow Partnership of Artists (MPA) every year, and joined the group in 1906. Usually she showed at its exhibitions significant and large-size pieces created between the associations' shows, such as the portraits of Alexei Remizov and Alexei Tolstoy, and the composition "Caryatids" (all created in 1911, Tretyakov Gallery); a display of gypsum versions of these pieces was also followed by a display of their wooden versions. She displayed her small pieces created in the same period at an "Akvarelnaya" (Watercolour) show in 1910: the works included the impressionist sculptural sketches "A Little Pool of Water" , "Flight" (later titled "Birds"), "Small Shrubs" (all created in 1908, tinted plaster). 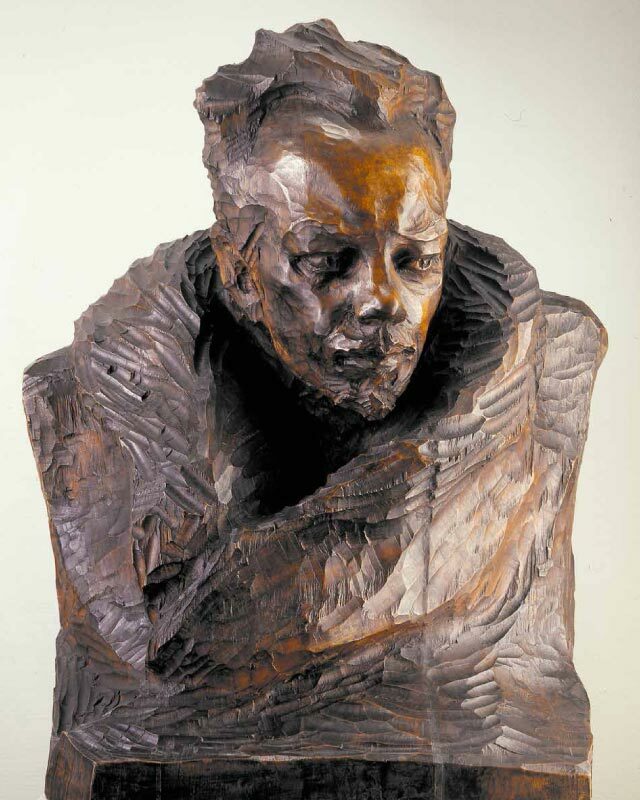 Golubkina also participated in the famous "Mir Iskusstva" (World of Art) exhibitions, where she displayed pieces in a style close to the new symbolist and Art Nouveau trends: the vase "Mist" (1898, tinted plaster), the bust of Mikhail Lermontov (1900, tinted plaster), "Old Age", and the mantelpiece "Fire". The exhibition "For the Benefit of the Wounded", held at the Museum of Fine Arts in 1914-1915, became a definitive show. The concepts of the Human Being, History, the Artist, Truth, Wisdom - such, arguably, were the points of reference of the exhibition showcasing pieces of art incarnating the main cultural and philosophical ideas of the Silver Age. The new and ever more complicated language of art of the early 20th century called for an audience able to interpret these artworks' imagery within their own aesthetic framework. The poet Andrei Bely explained the mode of perception along symbolist lines: "A work of art is not limited by time, place, or form; it expands infinitely in the depths of our soul... 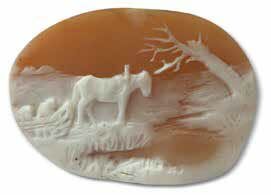 I carry [a statue] away out of its shell in my perception; the perception is with me forever. It is what I work on, and out of my work appear flexible shoots of the most magnificent images; the motionless statue flows in them, grows in them... courses outside amid statues and colourful sounds, and emerges in showers of sonnets; their impression is recreated in the souls that heed them. 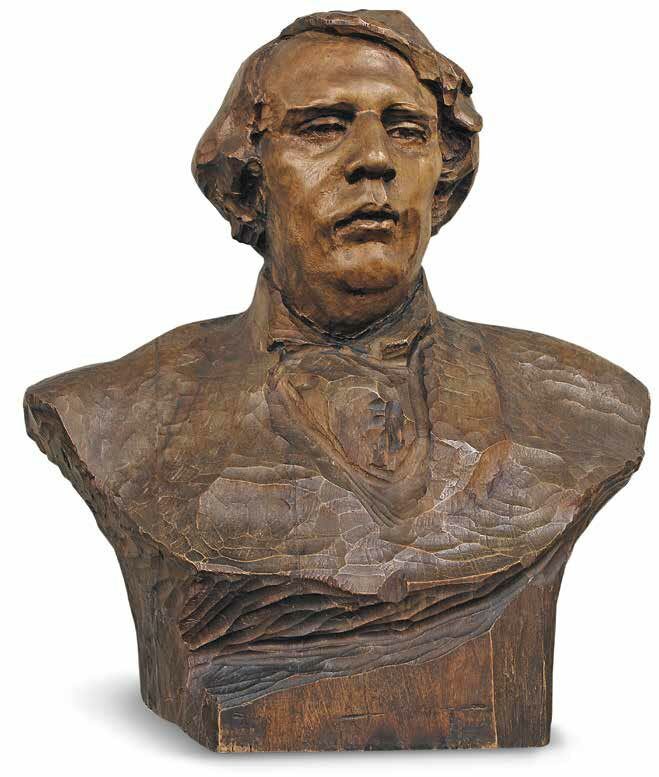 "1 Golubkina's sculptures did not often meet with such understanding, and yet, over time, the new style would win more support, and Golubkina's new works drew the attention of collectors. Her works graced the collections of A. Lamm, Mikhail Ryabushinsky and M. Shibaev; the biggest collection of Golubkina's pieces was held by Isajan Isajanov2, and the Tretyakov Gallery began to acquire her art. 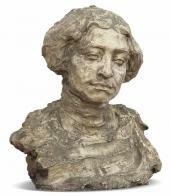 Golubkina's legacy includes many works connected with Moscow - most of all, portraits of Muscovites, created in different periods: the actress and translator Maria Sredina (1903 and 1904), the architect Anatoly Gunst (1904), the artist Nina Simonovich-Yefimova (1907), the businessman and patron of arts Nikolai Shakhov (1910s, all three in tinted plaster), the collector Genrikh Broccard (1911, tinted wood), the art scholar Alexander Nazarevsky (1911, tinted wood), the famous doctor Grigory Zakharyin (1910, marble, Sechenov Medical Academy, Moscow). 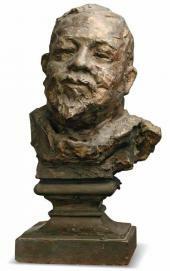 One of the first portraits Golubkina accomplished in Moscow was the image of the artist Vasily Perepletchikov (1899, bronze). Golubkina knew her model well - she was grateful to him for his help during her stay in Paris. When she settled in Moscow, she often visited parties at Perepletchikov's home, which drew art aficionados. 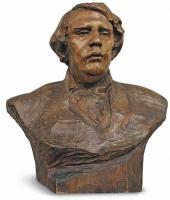 Golubkina depicted Perepletchikov as he was preparing to engage in a debate, with his characteristic tilt of the head and a sarcastic, penetrating look in his eyes. Another portrait, made in 1904, in a similar impressionist vein, features the artist Viktor Shtember's wife (tinted plaster) - the mistress of yet another home where the artistic crowd was warmly welcomed. Both portraits are impressionist statues in the traditional sense: fanciful free-flowing shapes, together with seemingly casual movements of the head and the torso, lend to the images an air of ease, strengthening the impression of the transience of the captured moment, which the sculptor apparently sought. Evening parties like those held at the Perepletchikovs' and the Shtembers' were not rare in Moscow at the start of the 20th century. 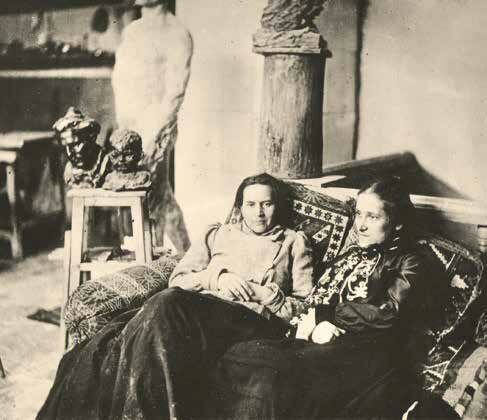 Golubkina attended such events in the homes of her Parisian friend T. Barteneva and the director of the School of Commerce Alexander Glagolev (she taught sculpture at his school), as well as Alexandra Khotyaintseva, a woman artist who was well acquainted with Anton Chekhov and a close friend of Chekhov's sister, Maria. In 1899 Khotyaintseva and Yelizaveta Zvantseva organised a private workshop, recruiting as teachers such celebrities as Valentin Serov and Konstantin Korovin, as well as Serov's student Nikolai Ulyanov. Golubkina joined with Ulyanov (who had been her fellow student at the Moscow School of Painting, Sculpture and Architecture) to open a workshop similar to that of Khotyaintseva and Zvantseva, and shared with him the studio on Krestovozdvizhensky Pereulok. It was there that she accomplished the famous relief "The Swimmer" (1903, tinted plaster), commissioned by Konstantin Stanislavsky and Savva Morozov for the new building of the Moscow Arts Theatre, and the image of Morozov himself (1902, tinted plaster). 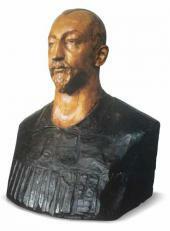 These are examples of a rather different style: the impressionist technique used in the bust of the famous patron of arts, divesting the image of its mundane features, separates it from the world of the everyday and approaches a symbolical interpretation. Morozov is represented as a pagan deity, an embodiment of elementary forces, which paradoxically goes together well with his reputation as a theatre enthusiast, innovator and joker. "The Swimmer", gracing the Moscow Arts Theatre, was Golubkina's first piece from her "theatre series". An admirer of the Maly Theatre, she later participated in a competition for the design of the statue of Alexander Ostrovsky and created a number of sketches. The playwright's image in the sketches was in keeping with the style and spirit of his plays and the Maly's traditions, while "The Swimmer" was a response to the Moscow Arts Theatre's innovations. The theatre's new aesthetic vision possessed a quality which Golubkina pithily described as"truth", as opposed to the qualities of the theatre of the past - in particular, the sparkling Parisian theatres, about which the sculptor, in her letters from Paris, said: "So beautiful, and false." The strong and profound impression made on her by the productions of Max Reinhardt's company from Berlin, which toured in Moscow in 1913, is captured in the reliefs featuring the Italian stage actor Alexander Moissi (1913, limestone), who played King Oedipus. Golubkina was stunned by Moissi's acting. Golubkina's Muscovite tastes in theatre were mirrored in an amateur company in Zaraisk, organised by local youth with the support of the Golubkina sisters. The repertoire included plays by Gogol, Ostrovsky, Hauptmann, Ibsen and Maeterlinck, which Anna had already seen in Moscow theatres. The productions even featured actresses from the Moscow Arts Theatre together with the local young people: Nina Alexeeva, an actress with a profound and passionate soul, was invariably the star attraction. 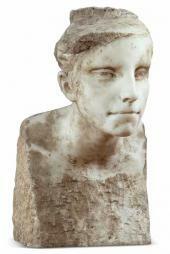 This "Amazon from Zaraisk" is depicted in one of Golubkina's symbolist statues "Nina" (1907, tinted marble). When Nina moved to Moscow, she studied vocals in a workshop at the House of Song, opened in 1908 close to the studio on Bolshoi Levshinsky Pereulok. In 1907 her sister Lyudmila entered an institution of higher learning for women, while also attending the dance school of Elli Rabeneck, who was a follower of Isadora Duncan. The new trend in moderne ballet - "free dance" - provoked enthusiastic response, and the public at the performances of Rabeneck's dance studio included many cultural figures, artists and musicians. Golubkina was one such delighted spectator, and it was she who supplied Lyudmila Alexeeva with a letter of introduction to Rabeneck. Golubkina's legacy includes drawings of the dancers and a relief called "The Lady" (1912, limestone) - presumably Alexeeva's portrait. Lyudmila Alexeeva performed leading parts in Rabeneck's productions, before taking up directing and teaching. She created one of her dances under the influence of Golubkina's composition "Flight (Birds)" (1908 ). Alexeeva's traditions today are kept alive in the Studio of Artistic Motion at the Central House of Scientists run by the Russian Academy of Sciences, and pieces choreographed by her remain in the studio's repertoire3. Living in Moscow, Golubkina had the opportunity to familiarise herself with those connected to the new trends of Symbolism. 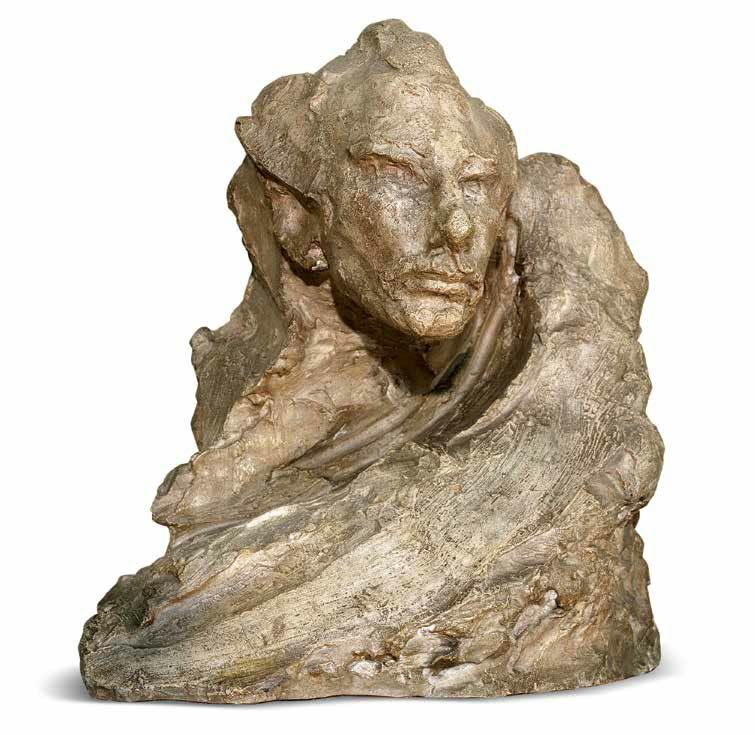 The mutual attention and attraction of the creator of sculpted images and the symbolist philosophers was steady and unwavering. The fact that Golubkina's art was a focus of the attention of such philosophers and critics is remarkable - among them were figures such as Vyacheslav Ivanov and Vladimir Ern, whose works formed the theoretical backbone of Russian Symbolism. It was Ern, a friend of Pavel Florensky (whom Golubkina knew well), who made a keen observation on the nature of Golubkina's art. This art fits within Florensky's theory of the heuristic role of art in the general process of learning. For Golubkina, creating a portrait meant getting to know her sitter, to understand him or her in the broadest sense and to convey this knowledge in sculpture. Golubkina, in turn, kept in her library a number of periodical publications of symbolist or similar character - magazines such as "Vesy" (Scales), "Apollo" and "Zolotoe Runo" (The Golden Fleece). The collection of books at her house also included the works of Andrei Bely, Vyacheslav Ivanov, Georgy Chulkov and Alexei Remizov. In 1907-1914 Golubkina created "a gallery" of the Symbolists' images: portraits of the leading poets and theoreticians of Symbolism Andrei Bely (tinted plaster, 1907) and Vyacheslav Ivanov (1914, tinted plaster), writers close to the Symbolists, such as Alexei Tolstoy (1911, tinted wood) and Alexei Remizov (1911, tinted wood), as well as the philosopher Vladimir Ern (1914, tinted wood). She captured Ivanov's and Voloshin's images in cameos (1920s). These portraits immediately highlighted, as an indisputable value, the individuals' distinctive qualities, and finely conveyed the nuances of their mood and their overall spiritual condition. The series of portraits of Russian writers and philosophers was brilliantly rounded off with the portraits of Leo Tolstoy (tinted plaster) and Vladimir Chertkov (tinted wood, Leo Tolstoy State Museum, Moscow) accomplished by Golubkina in 1926 on an assignment from the Tolstoy Society. She paid her tribute to the great writer's impressive personality, and fathomed the tragic conflict within his soul. Despite all the hardships that came with the 1920s, Golubkina did not leave Moscow. 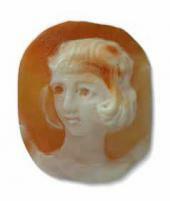 She taught at the VKhUTEMAS (the Higher Artistic and Technical School) and at a workshop she organised in her studio, she continued to create objects of applied art, mastered the craft of cameo making and created a unique array of cameo pieces. As before, Golubkina eagerly participated in Moscow exhibitions. 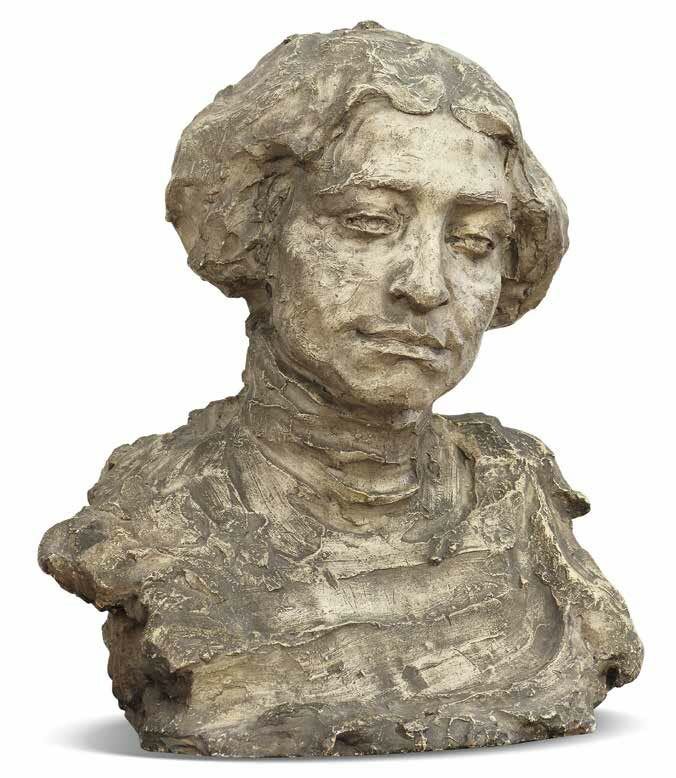 In particular, in 1923 she displayed her cameos at a Moscow Salon show, and in 1926 participated in the State Exhibition of Modern Sculpture, becoming one of the founders of the Russian Sculptors' Society (RSS). 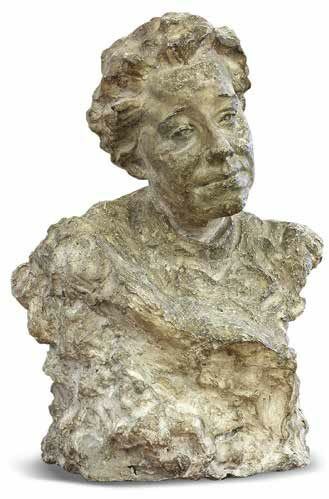 She displayed at the exhibition two portraits created in 1925: one of her student Tatiana Ivanova, the other of the moulder Gavriil Savinsky (both tinted plaster). Until her last days Golubkina continued to work in her Moscow studio on a project she cherished, the statue "Little Birch" (1926, tinted plaster). This piece was meant to epitomise her philosophy of life: the poet Grigory Chulkov once said about Golubkina that she lived holding in her hands "keys to the sky", and "listening to the songs of celestial bodies"6. Bely, Andrei. 'Revolution and Culture'. In: Bely, Andrei. "Symbolism as a Worldview. A Collection of Articles". Moscow: 1994. P. 298. Polunina, N.; Frolov, A. "Collectors of Old Moscow". Moscow: 1997. Pp. 176-179. Alexeeva, L. "To Move and to Think". Moscow: 2000. - Kulagina, I. "Lyudmiliana of Immortality (Lost and Restored)". Moscow: 2009. Rozanov, Vasily. 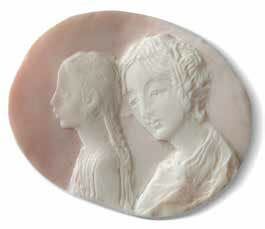 Achievements in Our Art of Sculpture'. In: "Mir iskusstva" (World of Art). 1901. Nos. 1-2. Pp. 111-113. - Rozanov, Vasily. 'Golubkina's Works of Art'. In: "Among the Artists". Moscow: 1914. Pp. 341-343. - Voloshin, Maximilian. Anna Golubkina'. In:"Apollo". 1911. No. 10. Pp. 5-12. - Bulgakov, Sergei."Despondency. Selected Articles Written in 1914-1915". Moscow: 1918. Pp. 53-62. Bulgakov, Sergei. "Quiet Thoughts". Moscow: 1996. P. 43. Golubkina, Anna."Letters. Brief Notes about the Sculptor's Craft. Memoirs About Her Written by Her Contemporaries". Moscow: 1983. P. 295. 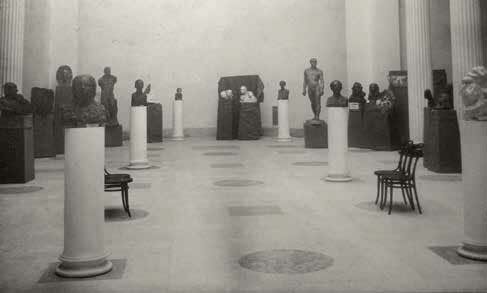 Golubkina’s exhibition at the Museum of Fine Arts in 1914-1915.